This will be a beach start and athletes in both Tristars 2 & 3 will swim the same course – you will swim ONE LAP. 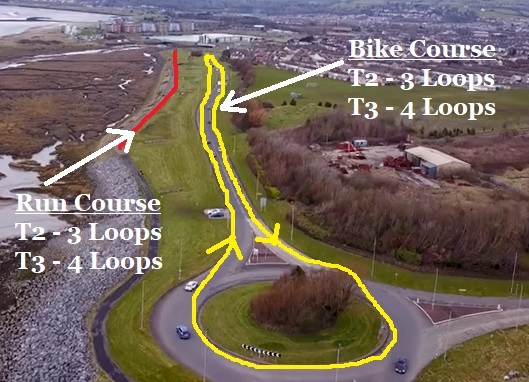 For athletes who have taken part in our Llanelli Junior Duathlon over the last few years you will be familiar with the Bike Course. You are also welcome to participate in the 2019 Llanelli Junior Duathlon that takes part on Saturday May 11th. This is a closed road flat course although the cross wind can make this course a little challenging. Tristar 2 athletes will complete 3 Loops whilst Tristar 3 will complete 4 Loops. Athletes will be responsible for counting their own Loops. The Run Course is flat and fast and follows the Millennium Coastal Path – Tristar 2 athletes will complete 3 Laps and Tristar 3 athletes will complete 4 Laps. This will be a great spectator friendly run allowing parents/guardians to provide athletes will superb support.